I’m also using the MIX48 Challenge requirements for this card today… at least 1 square, 1 circle, 1 triangle and a minimum of two mediums. 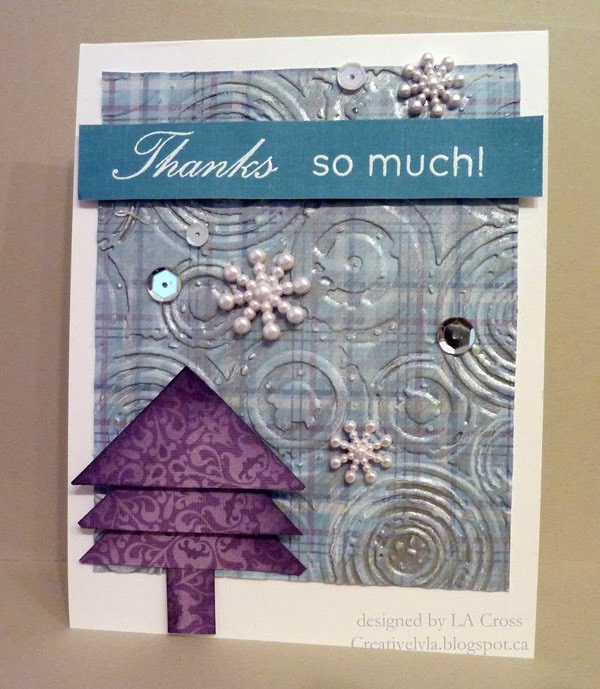 My background is made with a piece of plaid (my squares) designer paper (Echo Park Winter Wishes)…it’s been dry embossed with a circle motif. Then I added both Picket Fence and Brushed Pewter Distress Paints with my fingers, drying between the layers. The tree (my triangles) was simply made by cutting squares in half and adding a small rectangle for the trunk. Then I sponged the edges with Dusty Concord Distress Ink. The sentiment from Technique Tuesday Greenhouse Society was stamped in Versamark and heat embossed with white embossing powder. Then I added a few snowflakes and sequins for my embellies.